The thing that I love most about the Stickers 'N' Fun sketches is how much time they save me. I just have to browse through them for a couple of minutes to find one to suit the page I want to do and then I'm ready to go. I don't waste time figuring out what arrangement will work best. I simply pick my papers and get started. Here is a layout I created with this method. If you haven't used them before, browse our Sketch Archive and give it a go. You'll love how easy they are to use! 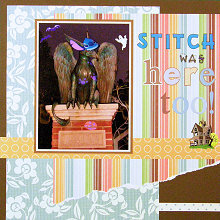 This layout was created using Scenic Route Charlotte Canal Floral paper, Scenic Route Charlotte Marg Stripe paper, dark brown cardstock, brown cardstock, cream cardstock, Sandylion Haunted House stickers and alphabet stickers including Pebbles Inc Make A Wish Alphabet stickers. Use the dark brown cardstock as the background. Cut a strip from the underside of Scenic Route Charlotte Canal Floral paper measuring approximately 10cm by 1.1cm. Adhere it horizontally in the bottom right corner of the page approximately 1.5cm from the bottom edge, as shown in the layout above. Cut a piece of Scenic Route Charlotte Canal Floral paper measuring approximately 21cm by 29.5cm. Adhere it vertically along the bottom edge approximately 1cm from the left edge. Cut a piece of Scenic Route Charlotte Marg Stripe paper measuring approximately 23cm by 27cm. Tear along the bottom edge. Make sure you create a sharp angle, as shown in the layout above. Adhere it along the right edge of your page approximately 2cm from the top edge. Cut a strip from the underside of Scenic Route Charlotte Marg Stripe paper measuring approximately 3cm by 30.5cm. Adhere horizontally approximately 8.5cm from the bottom edge. Mat your photo (I have used a 5x7 photo) with cream cardstock and again with brown cardstock. Adhere to your page approximately 5cm from the left edge of the page and 3cm from the top. You will notice the sketch features a second, smaller photo. If you would like to add this photo, please mat with brown cardstock and adhere to the right of your larger photo. If you do not have a second photo, you could add journaling in the space or do what I did - make your title larger. Use a collection of alphabet stickers to create your title to the right of your large photo. Finally, embellish your page with stickers (in my case, Sandylion Haunted House stickers), die-cuts, flowers or other embellishments.